Ahhhh....a dark, tragic drama. My favorite. Like so many other movies, it doesn't quite live up to the imagery you create in your mind from reading the book, but it's wonderfully distressing in its own right. Yes, I called the movie distressing because when you watch it, it's like you can feel yourself getting an ulcer from the tension and sadness of Jane Eyre. Turning classics into movies is always risky, but I actually think the casting was quite good. 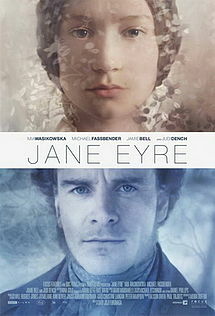 Mia Wasikowska's pale skin and mousy appearance make her a perfect fit for the slightly pathetic Jane. Michael Fassbender is great as Rochester because he just sort of looks like an a**hole already. Add in the bleak cinematography and melancholy music and voila! movie magic. My main complaint is that the movie couldn't evoke the tears I remember shedding over the book, although that was so long ago perhaps I was less jaded then (As in, go figure a guy is misleading you! Why would you expect anything less??). And the ending is portrayed a bit perkier than I'd expect. But I imagine if I hadn't read the book that these two points wouldn't be an issue. Final word: You've either got to love British costume dramas, or have a positive childhood memory of reading the book.